I’ll admit it: I came into this movie with expectations deeply tempered by all of the CGI-backlash fueled by recent big-budget box office flops. I’ve also seen prequels that couldn’t match up to the movie they were attempting to lead in, after the fact (I’m looking at you, George Lucas). Detractors beware: this movie actually really IS worth seeing. It’s also worth pointing out that, although this film will also be shown in 2D and IMAX, I really enjoyed seeing it in 3D. Sure, some of the 3D usage is a bit gratuitous (c’mon, they spent $200 million on the CGI! ), but much of it is just so well done that I found myself marveling at it and really enjoying the added depth it gave to the picture rather than finding it distracting or overwhelming. The movie opens in a boxed format and black-and-white tone that suggests you’re seeing something limited, something from the past that doesn’t quite meet current supersize, full color expectations. It’s the early 20th century, and dusty Kansas is receiving a visit from a traveling circus that’s home to a young con man named Oscar Diggs (James Franco – “Spiderman”, “Eat, Pray, Love”), who bills himself as Oz – a magnificent wizard extraordinaire whose powers require only that you believe (a constant thread in L. Frank Baum’s original story). As part of the early prequel setup, a sweet visitor from Diggs’ past runs through town, Annie (Michelle Williams – “Dawson’s Creek” and “My Week With Marilyn”), tries to goad him into committing by notifying him that she’s been offered the hand of Frank Gale. Diggs decides to let Annie go to a better future with a better man, but before he can truly finish saying goodbye he finds himself chased out by the circus’ strongman, intent on punishing him for taking advantage of a female member of the troupe. Diggs seeks shelter in a hot air balloon, taking with him only a few key belongings tossed up by his faithful assistant, Frank (Zack Braff – “Scrubs” and “Garden State”). A tornado soon enters the picture, pulling Diggs seemingly to his doom. It’s here that the 3D effects start to pour in; the twister is far more terrifying than the one in the 1939 “The Wizard of Oz” based on Baum’s tale (which I still find frightening to this day), with projectiles coming at Diggs from nearly every possible angle. His trip finally ends as the twister spits him out the top of the funnel and down he descends into a technicolor world that suddenly expands the picture to fill the entire screen: the land of Oz. The landscapes unfold in blistering bursts of color and sound that are lushly beautiful in a way that down-on-its-luck early century Kansas can’t match. He soon meets Theodora (Mila Kunis – “That 70’s Show” and “Black Swan”) and works his charms on her as she explains that he must be the one who will fulfill the prophecy that looms large over the kingdom: the wizard who comes to Oz bearing the very same name will be the one who frees it from the tyranny of the Wicked Witch. As they begin traveling together, they come across Finley, a small flying monkey of the variant from the “The Wizard of Oz”, voiced by Braff in one of several multi-role turns evocative of the 1939 film. Theodora brings Diggs to the Emerald City and introduces him to her sister, Evanora (Rachel Weisz – “The Mummy” and “The Bourne Legacy”), the King’s advisor. Evanora wastes little time in trying to drive a wedge between Theodora and Diggs, while she seduces him with the idea of wealth beyond his wildest dreams. All he has to do is go to the Dark Forest and kill the Wicked Witch. Diggs resists, but ultimately his greed wins out and he heads out on his quest. On the way to the Dark Forest, Diggs and Finley find Chinatown and rescue a young China Girl (Joey King – “Ramona and Beezus” and “Crazy, Stupid, Love.”) who joins them on their quest. The witch Diggs has been sent to kill turns out to be none other than Glinda (also played by Williams), the Good Witch of the South. At this point, Diggs’ life takes a serious left turn. What he thought was up turns out to be down, and what he believed to be true turns out to be completely otherwise. The various characters sprinkled throughout played by the same actors (such as Braff’s Frank and Finley, or Williams’ Annie and Glinda) serve much the same purpose as those from the 1939 film, providing the same measure of support and guidance in each of the worlds without the protagonist really understanding why. Of course, knowing that Diggs remains in Oz until Dorothy’s arrival, you don’t expect him to wake and find them all standing above him. So, to that end, this movie serves as a point for you to search for the clues – how will they make the origin story? Much to my enjoyment, several pieces from the original book live on in the movie: Chinatown existed in the book but never made it to the 1939 film, and Glinda is restored to her role as the Good Witch of the South (instead of the North). The Quadlings, who had little billing before, took center stage for the latter third of the film. The silver slippers (turned ruby for the 1939 film to help showcase the advance in color film technology) did not appear, that I was able to discern, but the measure of Diggs’ ingenuity in setting up the mechanisms to allow him to appear omnipotent to his subjects is explored well enough that you get the sense that he really is the savvy con man seen both in the book and the 1939 film. So, what does the movie do well? The CGI and 3D are really the stars of the show. Oz is gorgeous, otherworldly and magical, just as you would expect if you’d read Baum’s work. King is lovely as the China Girl and Williams is as sweet and gentle as Billie Burke had been in 1939. Kunis and Weisz give decent performances, although some of the contrivances added to Kunis’ performance in the latter quarter of the film seem a bit forced and unnatural. Still, it all comes together quite nicely. 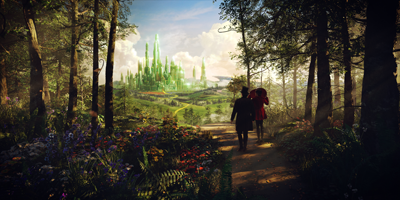 The beauty of “Oz the Great and Powerful” isn’t the attempt to get the Oscar – it’s the aim to tell a part of a story we never really heard before in such a way as to fascinate and excite us. It’s escapism at its height, pulling us so far our of our reality that we fall into another world entirely, just like Diggs. If the movie suffers from one down side, it’s a bit too much James Franco. He’s one of these incredibly frustrating actors who may have potential but seems to spend a bit too much time not feeling comfortable in his character’s skin. I had a hard time finding myself convinced that he was a slick con-man. It’s only towards the very end of the movie that he seems to be fully in command of Diggs, and perhaps that’s just because it’s only then that Diggs really sees how he himself is able to do what must be done. 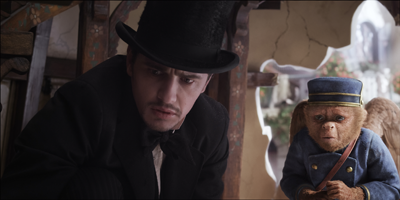 Still, it leaves too much of the film with Franco putting in a performance that doesn’t match quite as well as those of sweet, earnest King or the amusingly eager Braff. Keep an eye out for a late appearance by Bruce Campbell (“Evil Dead”); he’s a staple of director Sam Raimi (the “Spiderman” trilogy) and one of my favorite easter eggs in any Raimi production. As for the question of whether this movie is appropriate for young kids, I’d have to say that it’s not really one I’d recommend for those under the age of 8. There are some scary scenes, especially towards the end of the film, and the Wicked Witch’s flying baboons might be enough to send a Kindergartner into a crying jag. Add the extra punch of really well-done 3D (which this really was) and it might be a bit much for the truly younger set. Having years ago read the presumptive (and completely unrelated) literary prequel, “Wicked” by Gregory Maguire , and having walked out during the intermission of the eponymous musical (which I couldn’t have loathed more if I tried), I can say this is a decent enough take on the prequel concept without the political intrigue built into Maguire’s book. There’s plenty of setup without it all being over-the-top, and you could follow from this right into the 1939 movie without all of the drama and nerdy shouts of “CONTINUITY ERROR!” that occurred when Lucas decided to make prequels for the “Star Wars” trilogy. Lastly, make sure you’re there for the start of the film. The opening credits take full advantage of the 3D in a way that’s just utterly lovely, and they’re not to be missed. 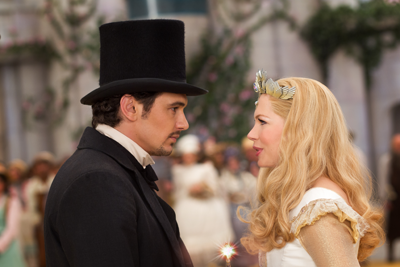 “Oz the Great and Powerful 3D” opens nationwide on March 8, 2013. This movie is rated PG (Parental Guidance Suggested) for sequences of action and scary images, and brief mild language. 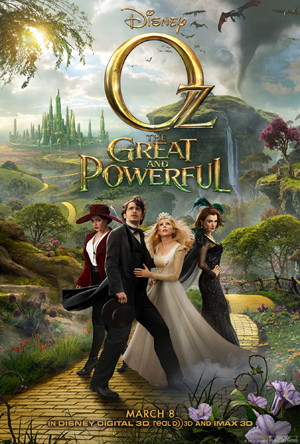 This entry was posted in movie reviews and tagged 3d, disney, movie, movie review, oz, oz the great and powerful, the wizard of oz by crunchymetromom. Bookmark the permalink. That’s exactly what the movie is: fun. Granted, the movie does have its fair share of flaws, but it’s still enjoyable. Good review.